Stack the most critical training and nutrition factors in your favor to optimize muscle growth. Learn to build a solid, sustainable approach to fitness—along with a stellar physique! You've seen the food pyramid—now meet the muscle-building pyramid! This simple structure lays out the essentials of what you need to do to add lean mass to your frame, while also providing the structure you need to prioritize them. 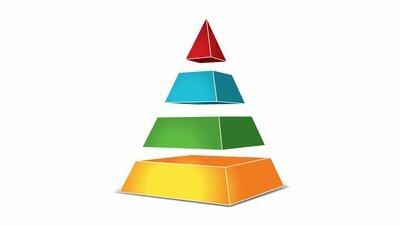 Each level of the pyramid builds off the next. What does this mean? Leap to the upper tiers without establishing the bottom two, and you'll end up sore, burned out, and confused. If you stick to the base, you can go a long way, but you'll be left wondering about your true potential. With help from EAS athlete Jason Wittrock, you can start at the base of the pyramid, and build your way—and yourself—up! Muscle growth starts with quality training, so the base of the pyramid focuses on training variables linked to muscle-growth processes. These are the factors that allow you to construct an effective program and create the stimulus your body needs in order to change! Favor free-weight, multijoint movements. Single-joint movements like leg extensions or cable cross-overs have their place, but they shouldn't be the centerpiece of your mass-building routine. Multijoint movements (think bench and squat) recruit far more muscle mass and give your body a greater stimulus to grow. Moreover, the challenge of handling a free-weight version of an exercise improves anabolism over a machine. Train at the right intensity. Exercise scientists have determined most people should train between 70-85 percent of their one-rep max to elicit an optimal hypertrophic response. Choose a weight that allows you to do 6-12 reps with good form before reaching failure. Add volume. Higher-volume, multiple-set protocols have consistently been shown to be superior over single sets when it comes to building muscle. This is one reason why advanced lifters often follow a body-part split. Higher-volume, multiple-set protocols have consistently been shown to be superior over single sets when it comes to building muscle. This is one reason why advanced lifters often follow a body-part split. Don't build up volume simply by doing the same thing with different implements. Change angles, rep ranges, and types of weights. Train to failure some of the time. Yes, you can grow without lifting to the point of failure, and certain movements don't lend themselves well to it. But all things being equal, if you stop short of failure—especially on isolation moves for small body parts like arms and calves—you won't get the same anabolic stimulus as if you pursue those last few challenging reps. Contain rest periods. For bodybuilding purposes, moderate rest intervals of about 60-120 seconds between sets maximize the hypertrophic response. Resting too long has been shown to be counterproductive to muscle gains because it reduces overall accumulated metabolic stress, a marker of hypertrophy. The smaller the muscle and lighter the movement, the less you need to rest. Lift with proper technique. Don't take this for granted! It supports everything else on this level. An exercise won't work the way you want it to if you're not doing it right. Get feedback on your form if necessary. If you get the training variables down, you're giving your body a great growth stimulus. But without proper nutrition, good luck turning it into muscle! Eat enough. If your goal is to add mass, you need to eat more calories each day than you're burning. It doesn't have to be a lot more. You can shoot for 0.5-1.5 pounds of gain in mass each week—or about 2-6 pounds a month—without adding significant amounts of body fat. That comes to an increase of about 300-500 calories daily over and above your maintenance level of calories. Check the scale regularly to determine whether your body weight is increasing within your target range. Eat enough protein. You'll hear a million different versions of how much fat or carbs you need. So let's focus on what can't be disputed: You need adequate protein to grow! Protein is essential to building and repairing damaged muscle tissue during hard training. Recommendations vary, but a time-honored amount that also happens to be the easiest to remember is 1 gram per pound of body weight daily, split into meals of at least 20-30 grams. Eat enough. If your goal is to add mass, you need to eat more calories each day than you're burning. So, how are you going to get it? "The easiest way to increase your protein intake is to make it your highest nutritional priority—which means you must always be prepared," says Jason Wittrock. "I prepare all of my protein sources in advance and always make sure I keep my whey protein with me. When I'm sitting down eating a meal, I'm already thinking about being prepared for the next one." Increase your meal frequency. Consuming a higher level of calories than you burn and getting, say, 180 grams of protein a day, is pretty tough on just three meals a day. Supplementing meals with protein shakes and protein-rich snacks every 3-4 hours will help to keep rates of protein synthesis elevated while reducing protein breakdown. Manage your excesses. You don't have to subscribe to the "cheat meal" approach to gain muscle. But let's face it: It's difficult to eat clean 24/7 and gain weight, simply because the foods you'll be favoring are relatively low in calories, and you won't always want to eat large amounts of them. It's OK to loosen the reins at times! Just do it on a hard training day, and make you're still hitting your protein benchmarks. You're training right and eating right. Great! You're on your way. Let's consider a few more factors that could make the difference between OK results and great ones. Incorporate progressive overload. Progressive overload simply means continually challenging your body to new levels of performance as it adapts to previous marks you set before it. You can do it many ways: lifting more weight, doing more reps, resting less, performing different movements—the sky is the limit, really. The key is to never fall into a comfort zone and never stop pushing yourself. "Chasing your full potential is a never-ending process," says Wittrock. "The minute you get comfortable, you stop growing. Don't be afraid to try new things, and always stay hungry for new information. The second I feel like I'm in a comfort zone, I re-evaluate my goals. If you don't have a big enough goal, you'll find yourself in a comfort zone very quickly." Use intensity techniques. These are all ways of training past the point of failure. We don't recommend doing them all at once or on every set, but once you've put in your time becoming fundamentally sound and strong in a movement, they can definitely help you take it to the next level. Forced reps: As you reach muscle failure, your partner steps in and provides with just enough assistance to keep the weight moving for another 2-3 reps.
Dropsets: Once you reach muscle failure, quickly reduce the poundage by about 25 percent, and immediately continue on with the set to a second point of muscle failure. Negatives: Instead of lifting a weight, lower it slowly for 3-5 seconds. Your partner then lifts the weight back to the start position. This works because you're stronger lowering a weight than lifting it. Use supplements that boost training quality. Certain supplements have well-documented mass-building benefits, often because they help you train harder and delay fatigue. Creatine has been shown to boost strength and muscle mass when used in combination with strength training. Caffeine can delay fatigue during all types of training. Branched-chain amino acids have been shown to help speed up recovery after a tough workout. Whey protein should be a staple of your supplement stack as well, as it's been shown to stimulate muscle protein synthesis and lead to greater increases in muscle mass and strength. Time your nutrient intake. When building muscle is the goal, the meals before and after your workout are the most important. Make sure both have adequate protein, but also carbs, which are going to help you power through an intense workout and jump-start the recovery process. Fats are less important at this meal, so focus on them at other times of day. Don't let recovery's location all the way up at the top convince you it's not important! It's crucial to keep you coming back to the gym, feeling good, and preventing your training from hitting the wall. Skimp here, and you'll feel it! Don't shortchange your sleep. Sleep is far more than just rest. It's the time when your body releases hormones that enable you to heal from training and grow stronger. Most people need seven hours of quality sleep each night. Make this one of your highest priorities. Rest from exercise. Part of this is up to your programming, but part of it is up to you! Don't shortchange your sleep. Sleep is far more than just rest. It's the time when your body releases hormones that enable you to heal from training and grow stronger. If you're serious about building mass, but you also play intense intramural sports regularly, chances are you aren't doing your muscle-building efforts any favors. It's extremely difficult to maximize muscle gains when you're pushing yourself in other physically demanding activities. "In order to build muscle, you must tear it down and allow it to rebuild itself," says Wittrock. "For this reason, rest is absolutely essential. I hate rest as much as anybody, but I know it's necessary to continue building muscle. Supplement for recovery. Experienced lifters often take a two-pronged approach to supplementation: those that boost workout intensity, and those that boost recovery. Make no mistake: The two go hand in hand. "My key recovery supplements are glutamine, a protein supplement with carbs, and BCAAs with electrolytes," Wittrock says. Cycle intensity. You shouldn't shy away from challenging workouts or programs. But training full-bore without stop for months on end is likely to do as much harm as good. Cycle in periods of lower-intensity training, and even time off from the gym, both for your physical as well as mental health. Muscle growth requires a lot of hard work, but also a lot of forethought and strategy. Don't negate all that quality training you've been doing by phoning in your nutrition or recovery. Establish a solid base, and you'll quickly surprise yourself with what you can achieve.